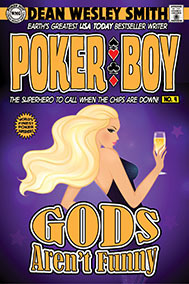 Poker Boy, still a freshly-minted superhero just learning the ropes at the time of this story, runs smack into the charms of someone who knows his secret name, knows who he is. And won’t let him use his superpowers. As a red-blooded young man with needs and hormones, Poker Boy must face those challenges in an epic battle of perfect skin, stunning looks, and a hormone-clouded mind.